If you’re like most creative entrepreneurs, you crave knowledge. You read 10 to 15 blog posts per day. Listen to a podcast every time you drive. And watch YouTube tutorials while chopping veggies. And while being self-taught is admirable (seriously, we’re impressed), many of these information rabbit holes lack the substance of a good old fashioned book. Books are better researched, have more credibility, and they don’t gloss over a topic. You could say books and blog posts are like Mac’s Ruby Woo Retro to Lip Smacker’s gloss. With a book, you learn everything you need to know about a topic and have long-lasting wear…I mean, applicable knowledge. That’s why we’ve created a list of our favorite financial books for creative entrepreneurs–to help quench your thirst for financial smarts. This book is great if you want to get your finances in order and start building wealth. It includes budget forms, case studies, and clear “baby” steps for managing your money. Much like you’d expect someone else to manage your money, you know…really well. Rachel Cruze is a living, breathing case study that Ramsey’s method and advice works. Literally, cause she’s his daughter. But, this book has a young, fresh perspective. And it’s all about embracing and owning what you have, not what everyone else has. It includes the essential money habits for living a life that aligns with your values, so you can afford what you want to buy without stress, debt, or worry. “This book has a lot of practical applications….It was like she was reading my life story to me. I put social media down so that I wouldn’t feel the need to do things due to what others were doing or fueling bad behaviors because of this book as that is what I found myself doing…” – S. Davis, Amazon Review. Do you discount your services? Or struggle to charge more because you’re afraid your clients will run for the hills? Grab this book and a highlighter. Cause baby, you’re worth it. Verbeck teaches you how to build a brand so you can charge more, create products to achieve a loyal client base, and also why you should implement a boutique way of marketing your business. The secret is out. To make money, you need to give more. Sounds counterintuitive, right? But in this classic bestseller, Burg will teach you how to change your focus from getting to giving. And why putting other’s interest first and providing value will lead to unexpected returns. It’s written as a modern-day parable which makes it a quick, easy read. To lose weight, you use a smaller plate, so your portions are smaller. Michalowicz applies this principle to profit. You take your profit first and apportion what remains for expenses. By following his four principles, you can simplify your accounting and achieve long-term growth. The book includes case studies, actionable advice, and some humor. What book made the biggest impact on your life as a creative entrepreneur? Share with us in the comments. 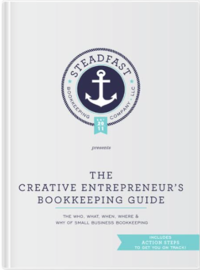 And don’t forget to grab our Free Bookkeeping Guide here to help you put those smarts to work. The Total Money Makeover changed our life: we paid off $88K of consumer and student debt five years and never looked back! Highly recommend. Just requested Profit First from the library – I heard him interviewed on the Entreleadership podcast and thought the ideas sounded great.